Join us at the NTL on May 22 to listen to Emmy Award winner and author, Amy Bass discuss her book, ONE GOAL: A Coach, a Team, and the Game That Brought a Divided Town Together. Lewiston, Maine, where McGraw coaches the Blue Devils soccer team, was an overwhelmingly white community in one of the whitest states in America. Once a thriving mill town of the Industrial Revolution, it had become pockmarked with abandoned factory buildings crumbling into the river and canals. More than half of the city’s families with children under five were living at or below the poverty line. In 2001, however, the city’s energy changed dramatically as thousands of Somali refugees began to arrive and Lewiston became embroiled in chronic racial tension. Within a decade, the town’s non-white population surged more than 800 percent. The city of 36,000 had become home to approximately 7,000 African immigrants; never in modern U.S. history had a town of its size taken in so many newcomers so quickly. 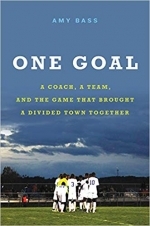 In ONE GOAL: A Coach, a Team, and the Game That Brought a Divided Town Together (Hachette Books; February 27, 2018), Amy Bass tells the timely and inspiring story of how the longtime Lewiston community and its newly arrived Somali immigrants came together on the soccer field to chase dreams of national glory. As Bass explains, perhaps nowhere were these racial tensions more apparent than on the high school soccer team, the Lewiston Blue Devils. As immigrant kids joined the team, they had to tackle language and cultural barriers while dealing with openly racist hostility on the streets of their new home. But behind the tumult and unease, the team, made up of both longtime locals and Somali immigrants and led by longtime coach McGraw, honed their plays and their teamwork to build a powerhouse with one goal: the first state soccer championship in Lewiston history. The Blue Devils’ efforts paid off stunningly, as they soared to the top ranks of high school soccer in a story that speaks to far more than sporting achievement. ONE GOAL showcases the Blue Devils and their championship run against the backdrop of politicians debating Syrian refugees and a national security and media landscape saturated with Donald J. Trump’s plans to build a wall, implement unprecedented travel bans, and denigrate immigrant homelands with profane language. Ultimately, ONE GOAL tells the story of what happens when America works the way it is supposed to, offering a testament to the power of community and a hope for our times — a story and a message more necessary now than ever. Amy Bass is a professor of history in New York and lived in Lewiston, Maine for four years as a student at Bates College. Her writing has appeared in Slate, Salon, and CNN Opinion, and her work for NBC's Olympics coverage earned her an Emmy in 2012 for Outstanding Live Event Turnaround. ONE GOAL is her fourth book. Capacity: 48 of 50 spaces available.